The rise of ransomware over the past year is an ever growing problem. Businesses often believe that paying the ransom is the most cost effective way of getting their data back - and this may also be the reality. The problem we face is that every single business that pays to recover their files, is directly funding the development of the next generation of ransomware. As a result of this we're seeing ransomware evolve at an alarming rate. In this blog post we explore traits of highly effective strains of self-propagating malware of the past, as well as advances in tools to facilitate lateral movement. This research is important as we expect adversaries to begin utilizing these capabilities in ransomware going forward. This blog post focuses on two avenues of thought - that our past is chock full of successful malware, and that successful cyber extortionists will look to the past to create new and evolving threats going forward. Ransomware is commonly delivered through exploit kits, waterhole attacks, malvertising, or mass phishing campaigns. 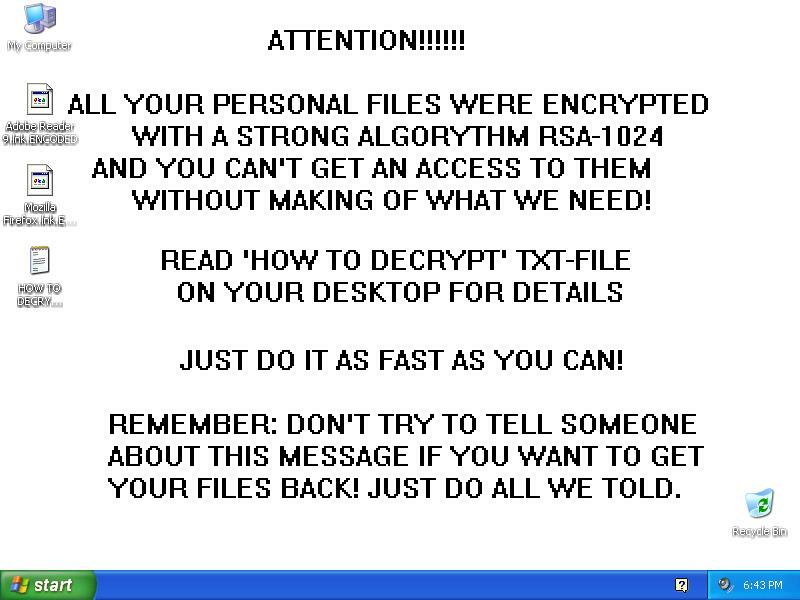 Once delivered, ransomware typically identifies user files and data through some sort of an embedded file extension list. It is also programmed to avoid interacting with certain system directories (such as the WINDOWS system directory, or certain program files directories) to ensure system stability for delivery of the ransom after the payload finishes running. 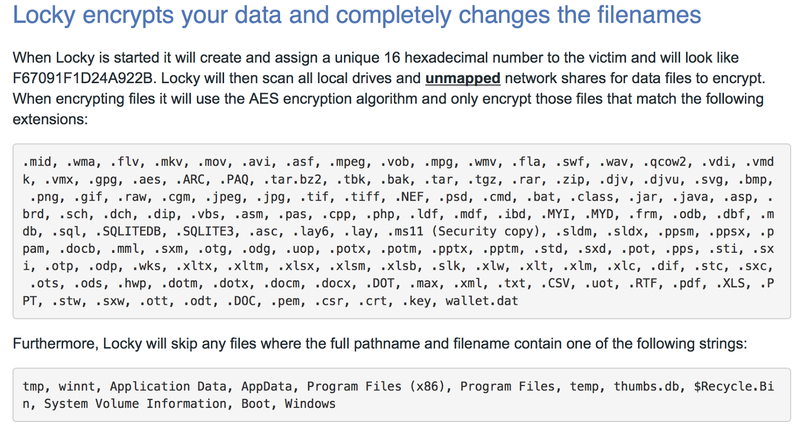 If the files are in a certain location and match one of the listed file extensions, encrypt the file. Otherwise, leave the file(s) alone. After the files have been encrypted, it typically leaves a notification for the user, with instructions on how to pay the ransom. Figure 1: Locky is a very recent ransomware variant. 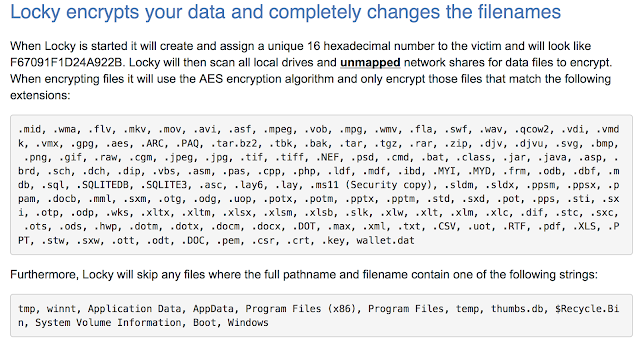 This is a list of file extensions the ransomware will encrypt if found. Ransomware is steadily becoming more targeted as it evolves. In order to understand the future of ransomware, we believe it is important to delve into the past of both ransomware, and highly effective self-propagating malware. We will also study recent ransomware events that seem to indicate a shift in targeting, and finally present scenarios we believe represent the most likely course of evolution". Let's rewind all the way back to one of the first recorded instances of ransomware: 1989. The AIDS Trojan was written by the "PC Cyborg Corporation", and spread via floppy disk. Fast-forward to 1996 and we see research paper written on what is then referred to as "Cryptovirology," or the use of cryptology for malicious purposes. Researchers create a proof-of-concept virus that encrypted files utilizing RSA and TEA algorithms, while denying access to the key used to encrypt the files. Fast-forward to 2005 and begin seeing ransomware in the wild: Krotten, Archiveus, GPCoder, et. al. Out of the malware families mentioned, GPCoder was the most interesting in that it was an instance of ransomware seen in the wild to using 1024-bit RSA encryption when encrypting files, making file recovery via brute force difficult. Figure 2: GPCoder was one of the first instances of ransomware in the wild utilizing strong encryption to guarantee a payout. In 2012 Reveton, a trojan based on both ZeuS and Citadel trojans, is the first observed instance of mass-deployed ransomware. The malware claims to represent different law enforcement organizations (depending on the locale being targeted). Victims would be presented with a notification on their system stating that their files were locked by a given local law enforcement organization and that in order to retrieve their files, victims were required to pay a "fine". Reveton would instruct the user to purchase cash cards or bitcoins and provide payment information through a website to get their files back. According to an article by Brian Krebs, Reveton was a veritable cash cow. The article cited payouts of approximately $44,000 dollars USD per day for just a single country targeted. That's over 1.3 million dollars per month for a single country targeted. Ransomware had just entered the big leagues. Ransomware continues to be threat to users around the world today. ; A threat that continues to grow bolder, going for larger targets and bigger payouts. According to estimates from our very own article exposing the details on how the Angler exploit kit operates, the delivery of ransomware payloads is a 60 million dollar a year industry for the Angler EK operators. That's an average of 5 million dollars per month. Please bear in mind, that this is just one exploit kit and one set of operators delivering one set of ransomware payloads. The bottom line is that ransomware is big business to cyber criminals. Figure 4: Figures directly from the Talos ‘Angler Exposed' research. These statistics are from a single Angler exploit kit operation. 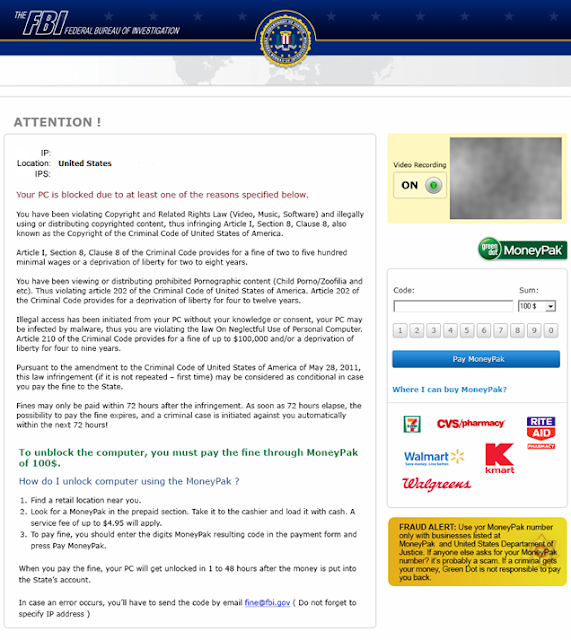 As we implied above, the Angler EK operators are not the only actors delivering ransomware. Recently, there has been a massive wave of activity from a new ransomware variant known as "Locky." 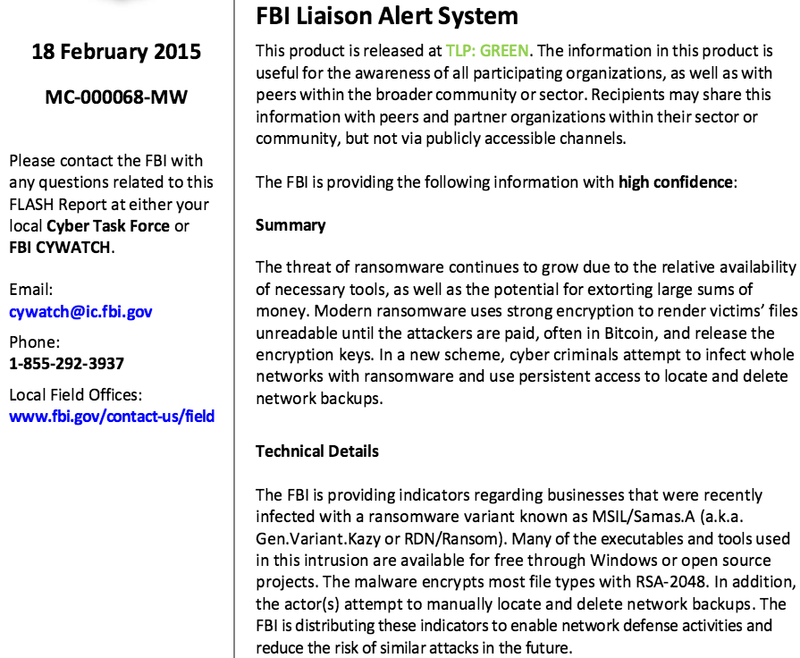 As is evident by the data we already presented, Locky is an aggressive ransomware variant. Locky may be a product that was both written and is being delivered by the operators behind the "Dridex" banking trojan. Recent research also seems to suggest an affiliate system for Locky, essentially reselling the ransomware where the admins/creators take a cut of the profits from payouts. Currently there is no consensus on how many victims are infected with Locky per day. The estimates presented below are very rough and are not guaranteed to be accurate; Talos group disclaims any responsibility for them. For all of the buzz surrounding SamSam, the attack methodology and payload are simple. First, the attackers gain access. One popular method of obtaining this access, according to some reports, is to use an open-source tool called "Jexboss" to target unpatched deployments of the popular JBoss application platform. Jexboss will fingerprint the JBoss server and perform a scan to determine if the target is vulnerable to one of the exploits it utilizes. If the check indicates the server is vulnerable, the attackers exploit the JBoss server and upload a JSP-based webshell to the system. Once the attacker has obtained a foothold on the server, they upload a tool such as "regeorg" to enable further compromise. Regeorg is a tool used to configure a proxy on a server, which is then used to gain further access to the target network. This technique is referred to as "pivoting." The attackers utilize this initial access to pivot deeper into the target network, looking for credentials to escalate their privileges. The ultimate goal for this stage of invasion is to locate and destroy networked backups before mass-distributing ransomware to as many systems on the network as they are able to access.. After finding the backup systems and destroying any local backups, or otherwise denying access to said backups, the adversary scans and enumerates as many Windows hosts as they can. After the hosts are enumerated, the attackers utilize a simple combination of a batch script, psexec, and their ransomware payload to spread the ransomware through the network in a semi-automated fashion (Notably, these are the same sort of distribution methods as legitimate systems administrators use in the course of their duties). The actual executable itself has an embedded secure deletion executable made by sysinternals that ensures the payload is deleted and unrecoverable through disk forensics. While the method used to spread the malware is crude, its results cannot be argued with: These attackers are currently in possession of ~275 bitcoins — over 115,000.00 USD,. 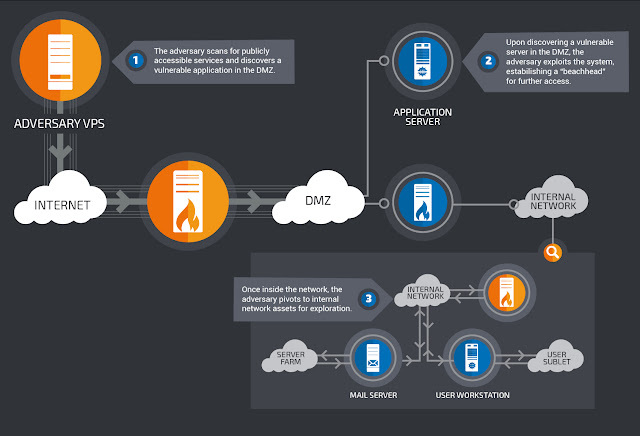 Figure 9: This illustration shows the course of action taken by the actors responsible for deploying MSIL/Samas, aka "samsam" illustration by Microsoft Malware Protection Center. Why would attackers opt to attack an enterprise network for a single lump sum as opposed to standard ransomware operations that seem to measure profits in the hundreds of millions? There are significant costs maintaining the infrastructure for persistent attacks - things like proxies for exploit kits and relays for phishing. These expenses are not only monetary, but also necessary efforts to remain undetected. Ransomware campaign operators have to constantly shift IP addresses, domains, and hosting infrastructure due to security researchers discovering their payloads and having the C2 sites blacklisted or otherwise shut down by the hosting provider or via take-down. Additionally, ransomware operators must keep their real identities secret in order to avoid arrest; so long as their ransomware campaign is active, law enforcement will be looking to arrest them and interrupt their operations. This must be done for an extended period of time in order to ensure that the ransomware turns a profit. On the other hand, ransomware like SamSam.exe does not require extensive, expensive infrastructure, and can be deployed with open-source tools quickly and effectively. This means that expenditures in an enterprise ransomware campaign are less expensive. Depending on how fast the attackers operate in the victim's network, payment can be delivered within a week or two. Infrastructure costs are reduced to a comparatively few proxies attackers will use to hide their true locations. This type of infrastructure can be cheap, and easily burned/removed after the attackers get what they want. After they have received payment, the attacker is able to lay low to avoid possible pursuit by investigators, and can focus on the comparatively low-risk laundering of their payment - generally in bitcoin - into currency more useful to them. A worm is a piece of malicious code that has the ability to self-propagate from system to system. This means that it can copy itself from system to system with no user intervention. Once a worm is released and has a viable propagation method, it's incredibly difficult to contain the infection, let alone eradicate the worm. Malware that was released years - in some cases, decades - ago is still alive and well today. Figure 10: This is the dashboard for a botnet/worm tracker. The data is gathered via passive and active network monitoring solutions. Some of the botnets and worms tracked are over a decade old and still going strong. Utilizes a vulnerability in a widely deployed product - Most of the successful worms of the past utilized vulnerabilities in products used across the internet. Microsoft Windows systems were and still are prevalent today, so it would make sense that these worms targeted windows systems for infection and propagation. Some of these worms were released as little as 17 days after the vulnerability was uncovered/patched, or six months or more after the initial vulnerability announcement. Copies itself to all available drives (network drives, USB drives, etc.) - Some strains of malware will enumerate local and remote drives and copy itself to said drives in order to spread and/or persist. (e.g. 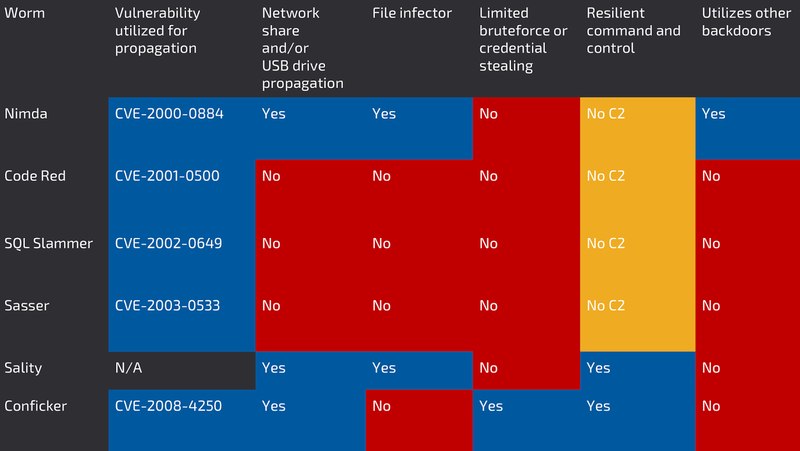 the malware will copy itself to the root of all local drives as an executable with both HIDDEN and SYSTEM attributes, and/or will copy itself to all USB storage devices as a HIDDEN, SYSTEM executable, with an autorun.inf that attempts to execute the malware when the USB storage is connected to another system). This allows for infection of systems that are not reachable via the public internet and/or offline systems. Conficker utilized this functionality for spreading through infected usb drives, as did sality,. File infector - File Infecting malware will either append or prepend itself to files. Specifically, they attach to executables that are not protected by Windows SFC/SFP (System File Checker/Protector). This guarantees that every time an executable is run on the system that is not considered a protected operating system file, there is a chance that the system may be re-infected. Some worms can attach themselves and spread via non-executable files as well. Limited bruteforce - Surprisingly, there are few worms that have attempted this method in the past. Some variants of conficker have a limited wordlist that they can use to attempt to access hidden "ADMIN$" shares in order to spread to other hosts. Conficker is unique in that of the self-propagating malware variants researched, it was the only malware to use this functionality. Resilient command and control - Some worms take into account actions normally used to disrupt command-and-control (or C2) infrastructure. These worms will implement preemptive measures to circumvent those disruptions - measures such as a set of actions to take if the C2 servers are unreachable, for instance, or non-standard network architectures for issuing commands. Many worms have no C2 infrastructure - they exhibit only a simplistic default action to spread as quickly as possible. An example of this would be the SQL Slammer worm - whose fast-spreading nature resulted in significant network slowdowns during the height of its activity. This worm spread through a widely available exploit in the very popular MS-SQL server. Its spread was helped by small size of both the infection vector and follow up instructions - just a single packet sufficed - and the ease with which it was able to find targets in the flat corporate networks that were common during its day.. Sality, on the other hand, has C2 infrastructure based on P2P networks - the same kind of networks that are used, for example, by file-sharing programs to allow client-to-client spread of content without the requirement for central, attackable servers. Finally, the Conficker worm, in addition to the P2P method just discussed, uses a technique called a "domain generation algorithm" (DGA) to determine from which hosts to receive instruction. The DGA is a programmatic method of generating a large number of domain names that the malware authors can purchase ahead of time to preempt defenders' blacklisting. As each domain in turn is blocked, blacklisted, or removed, the attackers can move to the next, presenting those trying to block the worm with a constantly-shifting and continually increasing threat landscape. Uses other backdoors - Some malware authors, aware that other infections may have already made an impression on a system, will piggyback on those backdoors in order to spread their own malware. This fascinating behavior was exhibited by the Nimda worm: it scanned for backdoors that were introduced by two prior worms, the 'Sadmind' and the "Code Red II" worms. If either backdoor was available, Nimda would access and infect the system by that avenue.,. Figure 11: Each of these botnets and/or worms had various mechanisms to fall back to in order to ensure that they would persist, and continue to propagate. They spread quickly, and were incredibly resilient. 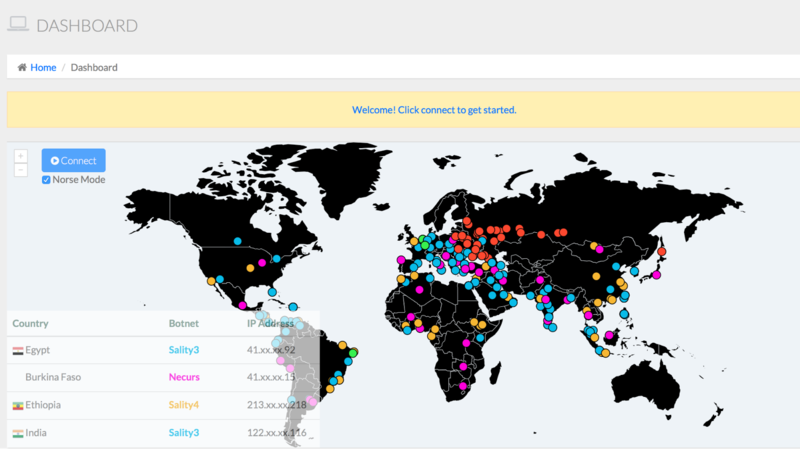 Some of these botnets are still alive today. Provide a helpful means to contact attackers, and instructions to turn your hard-earned money into your choice of semi-anonymous currencies to send to the attacker. Bitcoin is popular for that, but there's no reason to limit payment to just bitcoin - other, similar currencies also exist. Autorun.Inf/USB Mass storage Propagation: This module would search the infected system to find mapped drives, both local and remote. It would then copy itself to specific locations on those drives, and set the file attributes to make those copies harder to find and delete. Then, it would write an "autorun.inf" file into those drives, to request any computer that the drives are connected to in the future to run these infecting programs. This is a classic method of propagating - similar means were used by some of the first computer viruses - and the intent for this module is to hijack authorized employee access in the hopes of crossing any air gaps that would otherwise preclude infection. Authentication Infrastructure Exploits: This module would take advantage of some of the known weaknesses in popular authentication infrastructures, such as Kerberos, that are a component of many corporate networks. There are widely available tools, such as "Mimikatz," that use well-documented means of attacking this kind of infrastructure. These credentials can then be exploited to provide access to other systems, sometimes at an administrative level. Rate Limiter: Rate limiting: This module would ensure that the ransomware would be "polite" with system resources, making it less likely that the user will notice it executing. This means it would limit the amount of CPU usage, throttle its network usage down to a trickle, and ensure that it performs operations in as subtle a manner as possible. A group of skilled, financially motivated actors have been gathering information on a large company in preparation for an attack. An opportunity presents itself, and the adversary have gained initial access into the network. Our adversary is now required to escalate their privileges and identify critical targets in the network they need to control in order to increase the likelihood that their ransom demands are met. Figure 12: Depicted are common methods penetration testers and other adversaries use for establishing initial access into target networks. Attackers are learning to take advantage of native functionality in systems to move laterally within target networks, while reducing the risk of detection. Many operating systems have various remote access tools that can be used by attackers to move from system to system. Use of native tools to move laterally limits the capability to detect actors because they aren't dropping anything to disk, and are not performance actions that would be considered abnormal. It's not impossible to detect these things, but let's face it: Most SOCs or MSSPs won't notice it. This isn't opinion; it's fact. The average time between initial compromise and discovery is still over four months. Acquire Domain Admin level credentials and NTDS.dit - acquiring domain admin credentials allows me access to the domain controller. With access to the domain controller, attackers can acquire a copy of NTDS.dit use kerberos golden tickets to pivot through the network with little resistance. This also grants the attack all of the password hashes for every single account in the domain, which they could start attempting to crack or simply use for "pass the hash". Identify backup systems and/or if possible, D/R systems (NAS, SAN, Tape robot control, Sungard, etc.) - Once the adversary has domain admin and NTDS.dit, they have free reign to start mapping out the network. The next goal is to find the backup systems and servers, identify what platforms and software they're running and how best to disable/cripple them. Additionally, if there are credentials and access to recovery sights (hot/warm sites such as Sungard that the target may use for attempting to recover from the attack) identify them so as to target them for ransom or to deny access and further guarantee ransom. We aren't attacking these systems yet, just identifying targets for when our we drop our implant. Identify systems with critical data and services (databases, CMS, Code repositories, file shares, etc.) - At this point our attackers have the keys to the kingdom and have identified backup and disaster recovery systems. The next logical step is to map out the environment and determine high value targets. What and where on the network are the mission critical systems? Where are the databases? Web applications? HR Systems? Payroll Systems? File Shares? There's a good chance that if attackers found the backup systems and the backup network wasn't segmented (not terribly likely), that those systems dropped hints as to where everything else is that the company wants backed up is located. Identify messaging servers - In addition to mission critical systems, identify all messaging systems. VOIP, E-mail, Enterprise Messenger applications, etc. The hardware it is to reach anybody and coordinate during the attack, the more time that buys the attackers to maximize the spread of the ransomware. Identify systems responsible for performing software application pushes - SCCM, WSUS, some A/V vendors allow you to push packages, GPO, etc. - There have been a few very recent recorded instances where this was the a method of propagation for malware targeting an enterprise network: Compromise application distribution platforms and use them to distribute the payload. While our malware would certainly have capabilities to self-propagate, we would use these application distribution platforms to make our ransomware spread exponentially, making the attack much more difficult to contain. Rate Limiter: This ensures that the malware isn't detected by network or CPU utilization anomalies. 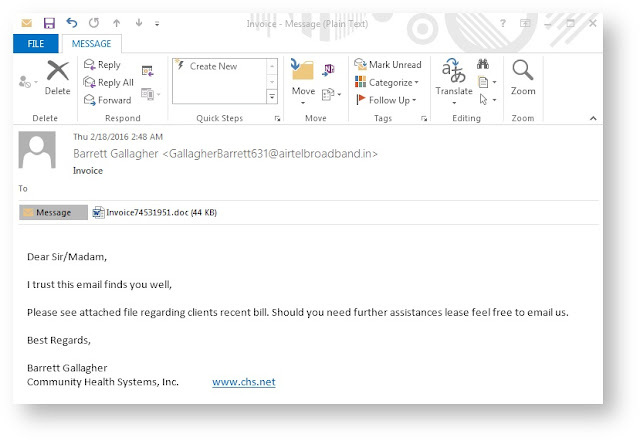 The attackers have access to modify group policy and modify the domain's GPO to deliver an MSI wrapped version of their custom ransomware implant. They then leave the network and simply wait for the ransom to be paid. The malware spreads exponentially thanks to a combination of compromised hashes and/or username/passwords and software pushes via GPO spreading and executing the malware. Typically, most corporate networks lack network segmentation thus furthering the propagation of the ransomware payload to even more systems. While the backup tapes themselves have not been infected (on or off-site) the backup management systems are infected and cannot be used to restore backups. Core applications and systems begin to fall one-by-one as the ransomware continues to propagate. It quickly becomes evident that systems are under attack, but with messaging systems and applications being attacked and only out of band comms (cellphones, externally hosted chat systems) being viable, coordination is slow, giving the ransomware even more time to spread. Figure 13: Depicted is our fictional adversary's workflow for completely compromising the target network with their ransomware. Once launched, the malware is more or less unstoppable. In the span of an hour, over 800 servers and 3200 workstations are compromised; half the organization's digital assets, and the vast majority of the company's data are encrypted. Disaster Recovery mode is initiated, but the DR environment was also compromised due to shared credentials and poor segmentation. The target is forced back into the 1980s: digital typewriters, notebooks, fax machines, post-it notes, paper checks and the like. The victim is left with a choice: Do we pay the ransom, set a precedent and rapidly recover? Or do we refuse to pay the ransom and potentially make the recovery much longer and more difficult with a guaranteed loss of data? In either case, there are going to be costs associated with recovery, such as hiring external incident response capability to help determine root cause and/or bolster internal incident response, capital and operational expenditures required for both security and IT staff to work around the clock to bring systems back to operational status, etc., There are numerous quantitative/qualitative damages attached when becoming a victim of such an attack. We also haven't come to the decision as to whether or not the victim will pay the ransom. These questions (and perhaps more) factor a simple calculation: If the cost associated with paying the ransom is less than the cost associated with the loss of data for that gap of time between off-site backups, then in all likelihood, the organization will pay the ransom. Otherwise, the organization will accept the loss, and begin the recovery process. 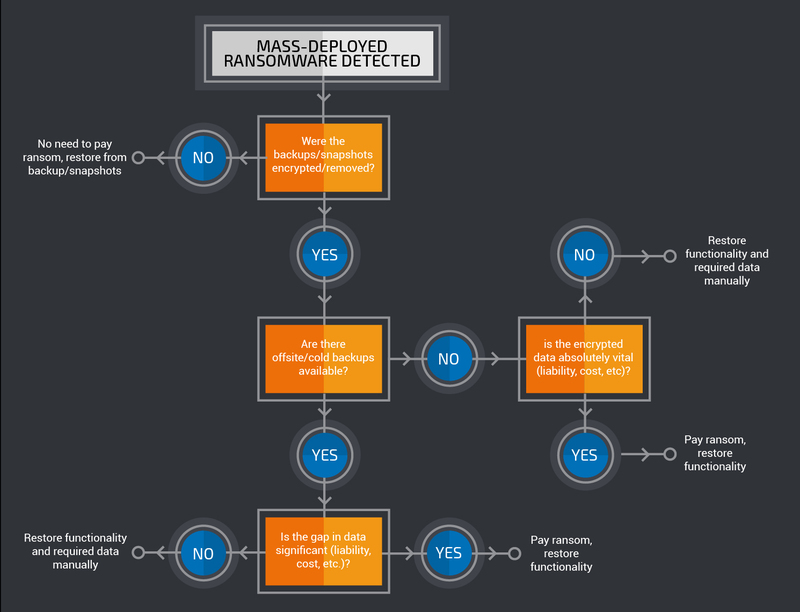 Figure 14: In the event of a Ransomware breach, this flowchart may ultimately govern whether or not the victim pays the ransom. Is there a rider on the policy to cover ransomware or "cyber extortion"? In most cases, the cyber insurance policy is either insufficient to provide full coverage, or didn't attach an appropriate policy rider to cover specific damages. As we have established in our narrative, in the hands of skilled attackers, ransomware with self-propagating capabilities can become a nightmare. Just because it can happen, doesn't mean it has to. The scenario described was purposefully generic because by and large, most enterprise networks are architected in roughly the same manner. This means that our scenario can be applied almost universally regardless of target. Due to this homogeneity of enterprise network design, the question of "What happens when attackers target us?" results in the same answer: If solid perimeter defense is not present, then initial access is established. If initial access is established and the threat is allowed to move laterally within the network, their privileges escalate and they map the network for access to assets that help them achieve their goals. If the privileges are allowed to escalate, it results in a complete compromise and loss of service for the targeted organization after the ransomware is deployed. The question then becomes: What happens when attackers are no longer content with attacking hospitals opportunistically, but then sets their sights on a different organization, or a different vertical? Power, gas, water, shipping, air traffic control? Now more than ever, defense in depth is more than a concept, more than just words that have been preached for decades, it becomes necessary practice. Periodic port scans: Port scans can be utilized to map one's DMZ and gain a better view on actual services and operating systems an organization is exposing to the internet. Once you have a collection of exposed services, you can map the public addresses to private addresses, determine who owns the asset(s) and/or whether or not exposure of the service(s) is even necessary. The lower the number of services exposed to the public internet, the lower the attack surface available. Consider investing in a company-sanctioned file-sharing program for exchanging files between users in the organization and/or company partners. 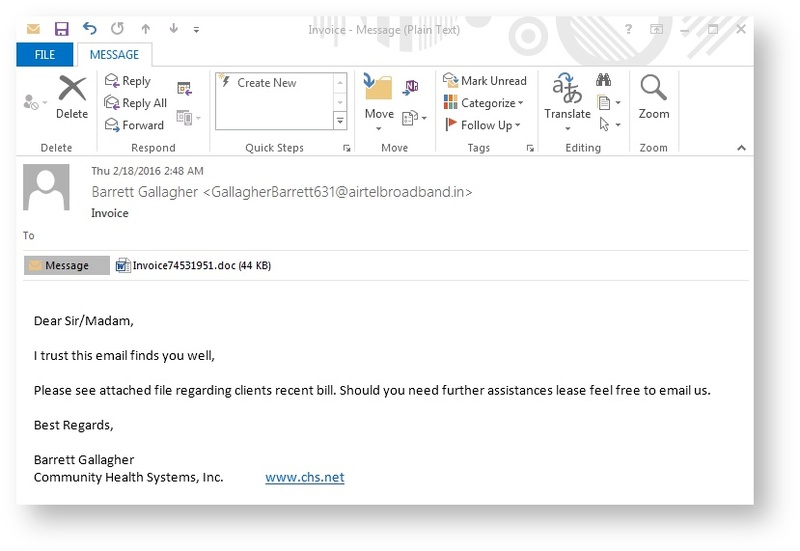 Utilizing a file-sharing solution, and instructing users to never share or accept files over email can almost completely mitigate phishing attacks utilizing attachments. Instruct your users that the mail server isn't for file exchange, nor is it meant for archiving files. Instruct users to trust but verify, especially for any messages from outside the company with attachments. Simply asking the sender "Did you send this?" Over the phone prior to opening the attachment is all it takes. If users are in any way concerned that they have been phished, instruct them to report the incident. The users shouldn't fear your SOC or security department and should NOT be punished for reporting security incidents. Disallow the mounting of USB drives. This mitigates the "print my resume for me scenario" as well mitigating self-propagating malware that attempts to jump air gaps through compromised USB drives. If removable media cannot be disabled across the enterprise, at a minimum disable autorun for removable media via GPO, and instruct employees to never accept or use thumb drives from untrusted sources. Instruct users that all thumb drives should be scanned for viruses upon insertion and before users access the files; consider configuring antivirus to perform automatic on-access scans for any USB drives plugged into systems. If utilizing thumb drives in a sensitive airgapped environment is required, consider keeping a collection of thumb drives, tagging them as company assets and signing them out on each use. Tailgating, or the practice of unauthorized individuals following authorized individuals into a restricted area, and can be a big problem. Most people have a tendency to avoid confrontation, so this makes enforcing tailgating policies a little more difficult, especially when challenging individuals who appear to "have their hands full". This can be mitigated by writing into security policy a requirement that employee badges must be present and visible at all times. Additionally, all authorized guests, vendors, etc. should be required to adhere to this policy, and badge in to all gates and be escorted/shadowed by an employee at all times. Host-based firewalls with ingress/egress filtering configured. Again, ingress and egress. Hosts should not be able to communicate via SMB (139/tcp, 445/tcp) between one another. If file server(s) are set up, then there should effectively be no need for this. If you can effectively disable host-to-host SMB communication, you prevent the attackers from being able to utilize the "pass the hash" for lateral movement. SMB communication should be limited to application distribution platforms, file shares, and/or Domain Controllers. Backup recovery is your last line of defense to having to pay out a ransom to the attackers; it's your last bastion in the event that the worst has happened. Your ability to recover from this attack with minimal data loss and/or service interruption amounts to whether or not the system backups and/or disaster recovery sites were compromised as a part of the attacker methodology. Whether or not your backups were compromised depends on how well your backup systems and/or network and/or recovery sites were sufficiently segmented from your main network. Even in the event your organization does not utilize on-site backups at all, instead opting for cloud backup solutions (e.g. Amazon Glacier), if those cloud backup credentials are left in easily accessible locations, or if passwords are reused, our hypothetical adversary could easily delete all backup instances, resulting in 100% data loss if there is no other backup solution in place. The secure, off-site, enterprise backup solution could easily be defeated through password reuse and/or poor password management. For enterprises utilizing backup solutions, there are a wide variety of backup methodologies; the SANS reading room has a comprehensive document on tape rotation schemes that is incredibly helpful for reviewing different tape backup schemes. Typically as a part of a tape rotation policy, a portion of those tapes are delivered to an off-site storage facility. This is for disaster recovery purposes; if there a catastrophic failure at the site hosting an organization's data, the tapes at the storage facility are still there to recover from at a backup facility. In a scenario in which local backups are deleted, removed, or otherwise made inaccessible by the attackers, off-site backups are often your only hope of restoring service without paying the ransom. Depending on how often your backups are sent off-site determines how much data (if any) would be inaccessible or lost. To emphasize this, one need look no further than SamSam.exe, the malware sample recovered from a number of scattered enterprise network breaches mainly targeting the healthcare vertical. SamSam isn't complex, and it not fully self-sufficient, but it does exhibit some of the behaviors of a successful worm - rapid propagation, payload delivery (ransomware), and crippling recovery efforts. The age of self-propagating ransomware, or "cryptoworms", is right around the corner. For too long, critical security controls and best practice for enterprise network security has been publicly praised and privately ignored. Drop-in appliances and security solutions can only do so much to protect the network, and will do little to stop this threat if networks continue to be architected and expanded without defense in depth in mind. If enterprises don't start making strides towards defensible architecture today, massive ransoms may end up getting paid tomorrow. Awesome job. Thanks to everyone for putting this together. Great.. Very very Useful information for many.. Thanks for sharing. Very nice. Thanks for this. A thought on RFC 1918: Strangely, a surprising number of organizations sloppily use public IP's on private networks. If RFC 1918 limitations are utilized as you describe, these network segments could actually be immune in certain scenarios. Normally, I tend to encourage admins to comply with RFC 1918 and re-IP offending networks. As you describe it, they may actually be better off with non-1918-compliant networks. Also wanted to point out a typo: "The >>hardware<< it is to reach anybody and coordinate during the attack"
3. Attackers contact the hospital and demand ransom: "We killed 1 this morning and 5 more will die at noon unless we recieve $2,000,000." 6. The attackers (hopefully) access the compromised medical devices remotely and stop the countdown so the patient isn't harmed. Scary stuff. But important to prepare for. 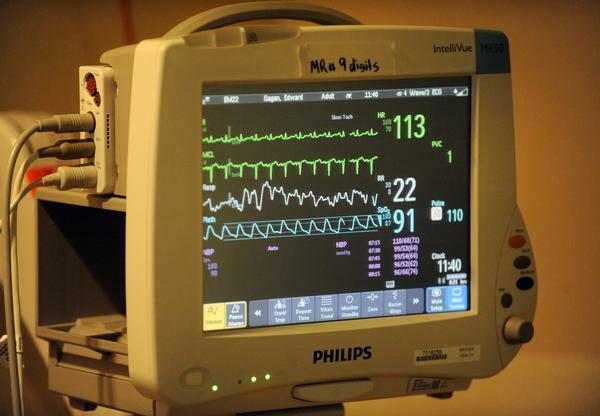 ... That's why medical equipment always has backups and even devices that are operated purely by hand. Why is Stuxnet not mentioned in chapter 4 ? This is a great write-up, thanks. As someone who is in the educational sector, it is very difficult to keep up with the latest on exploits and ransomware and at the same time explain it to the users. It is even hard to explain to management why we need to invest in more defence software to keep our system secure. Hopefully in the future this will be a non-issue, and companies are going to start taking this more seriously. There have been several cases already of government entities, police dept. and major hospitals falling prey to ransomware. There needs to be a massive effort from all software companies and businesses to promote a culture of backups, instant restore software (Shadow Defender, Rollback Rx) and other mechanisms to combat these attacks on your computers.